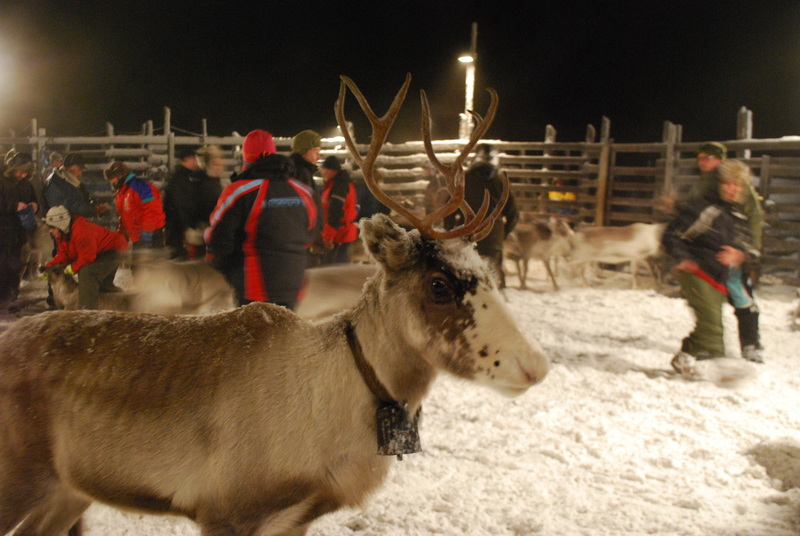 Lapland is reindeer country. They roam free across this flat land, docile as cattle, standing in the roads or digging for lichen in the deep snow. But they are not wild animals, or not entirely. Many are owned by the Sami people, the indigenous group once known as the Lapps, who live throughout Arctic Scandinavia and western Russia. The reindeer herders are – or, for the most part, were – a semi-nomadic group, migrating north to the coast with their animals for the short Arctic summer, south to the forests over winter. Modern life has not been kind to the Sami. Main roads and national borders have sprung up across centuries-old migration routes, while many of the traditional ways have become lost after generations of Sami children were sent to Finnish language boarding schools in the south – from which many never returned. But Sami culture lives on. Recent government initiatives have pumped money into Sami-language education and cultural revival. Here in Enontekio, the elderly Sami ladies can be spotted their embroidered smocks and bonnets in the supermarket, browsing the sweet selection. The Sami men, oozing testosterone, can be found in the only bar in town, or blearily winding their way home again on their snowmobiles. Reindeer herding here is still very much a way of life. Although the majority of the Sami reindeer herders now keep a permanent home – a house, a car, a comfortable bed – life is still dictated by the changing seasons; the movement of the reindeer. The onset of deep winter prompts hard decisions. Once or twice through the cold months, the reindeer are herded from the woods and gathered together so that each family can identify from their own animals which will not survive the hardest weather. The weakest and smallest are singled out and pre-emptively sent to the slaughterhouse – the income from which will make up the profits for the season. They are therefore an important event in the Sami calendar, but the separations themselves are small, family affairs – just a cluster of cars parked by a floodlit paddock. I headed to Näkkälä, 40km north of Hetta, to join the Näkkäläjarvi clan during their latest separation. It wasn’t a long drive but it felt that way, with nothing to see but the road markers flicking past the windows – tall orange poles with fluorescent tips to mark where the road ends and the snow drifts begin. Then, suddenly, bright lights flare out of the darkness and we were there. 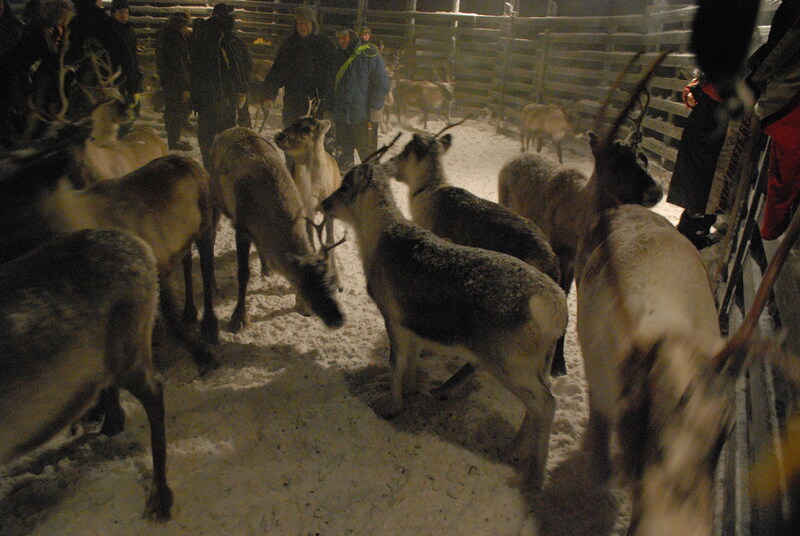 A circular wooden ring is heaving with reindeer, from small calves the size of dogs to heavy-antlered bulls. They are strange creatures: grunting like pigs, but trotting like horses. Velvet hung in ribbons from many of their antlers – shed a few weeks before the antlers are themselves, ahead of the coldest months. Only the pregnant females will retain theirs through winter. In the ring, they sent the snow up like sand as they scurried, panicked, in circles, showing the whites of their eyes. There were twenty or more Sami herders, dressed in snowmobile jackets and decorative belts for their tools and sheathed knives. They stood, hands in pockets and cigarettes hanging from their lips, in the centre of the ring, breath coming up in clouds. ‘It is the most important meet of the year,’ I was told by Daniela, the only English-speaker taking part. 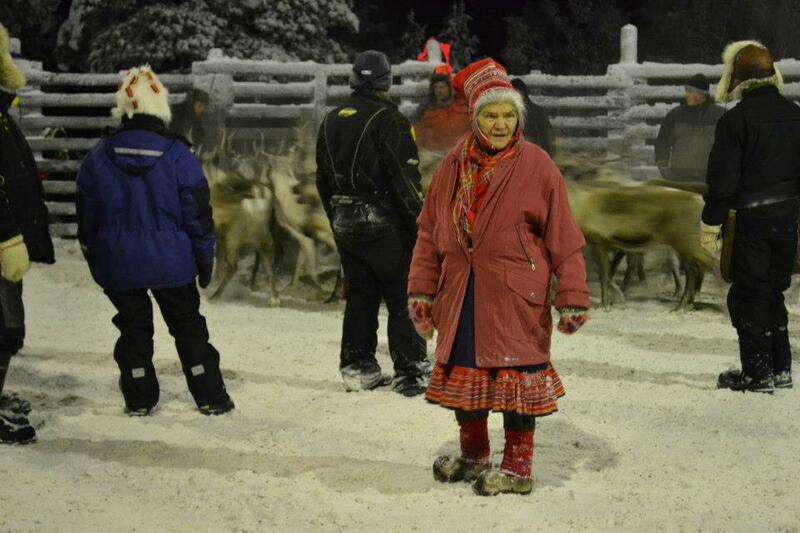 A Swiss national, she had moved to rural Lapland when she married into a Sami reindeer herding family. I shadowed her in the ring as she looked for their reindeer amid the herd. Spotting one, she sidled towards it and shot out a hand to grab hold of its antlers. He tried to spring away, but it’s too late. Daniela pulls its antlers to her chest as it struggles, before her husband pulls its back leg up and it falls to the ground. The pull it to the nearest gate, and release it. 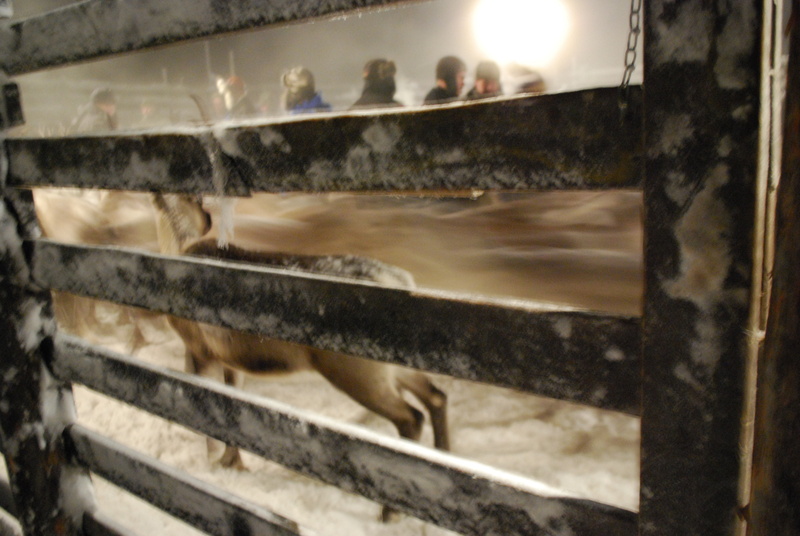 In the pen behind, the deer sentenced to the slaughterhouse milled anxiously, some bloodied from where their ears have been cut, marking their fate. Over the next month I’ll be researching an article about the Sami people’s battle to have their land rights recognised, and the challenge this would pose small communities like mine in Hetta.